Canadians value their natural environment. Nine out of ten worry about the impacts of environmental degradation on their health. Nine out of ten are concerned about climate change. Eight out of ten believe that Canada needs stricter environmental laws and regulations. And 95 percent of Canadians consider access to clean water a basic human right. So, do Canadians actually have a constitutional right to live in a healthy environment? According to David Boyd, the answer is no (at least, not exactly), but he explains why they should in his new book The Right to a Healthy Environment: Revitalizing Canada’s Constitution. On this episode of the podcast, we speak with David Boyd about Canadian environmental rights. 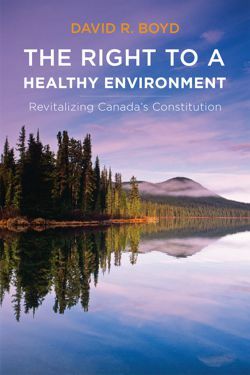 Boyd, David R. The Right to a Healthy Environment: Revitalizing Canada’s Constitution. Vancouver: UBC Press, 2012. Kheraj, Sean. “Episode 42: The Right to a Healthy Environment” Nature’s Past: Canadian Environmental History Podcast. 17 March 2014.